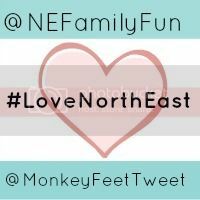 Welcome to #LoveNorthEast - a place to link up your North East blog posts this May. Thanks again to everyone who linked up last month, I absolutely love reading everyone's posts. I am picking this post from Nelly's Cupcakes featuring their Easter Day out at Alnwick Garden as my post of the week. I love the image of Zoe jumping on one of the water features in the serpent garden. 1 - Add our badge (copy and paste the code below into the HTML of your blog post at the bottom. If you are confused - just ask and we'll do our best to help). Alternatively, you can add a text link that links back to this post or Karen's #LoveNorthEast post at the bottom of your blog post so people know where to find us. 3 - You can link up one post every month. Posts must be written by a NE blogger or be written about the North East. Business posts are also welcome and posts can be old or new.